If you buy coffee at a Starbucks in the Washington, DC area today or tomorrow, do not be surprised to find the words "Come Together" scrawled illegibly on your cup. 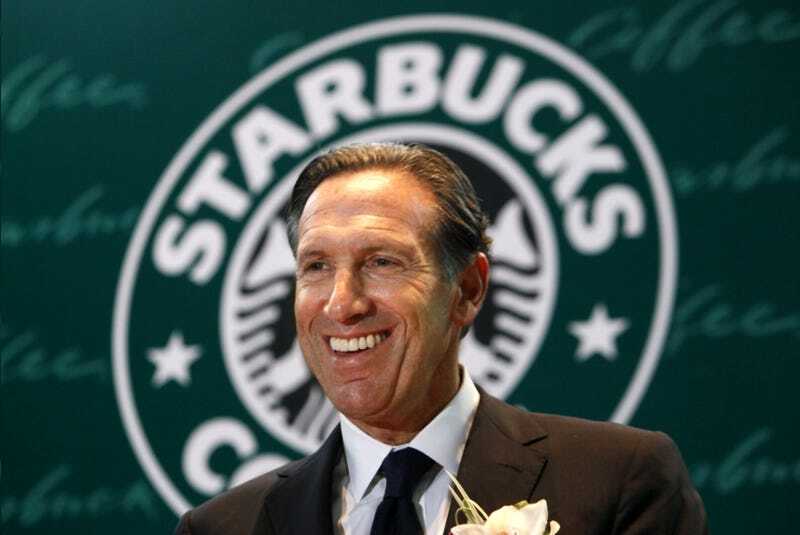 You can blame this on the fact that Starbucks CEO Howard Schultz is a tepid showman masquerading as a bold visionary. Schultz, a billionaire who controls a powerful and culturally influential global corporation, uses his influence in the most insipid way possible. He does not throw his money, reputation, and resources behind things that may be controversial, but which he feels strongly about, like the crazy dude that runs Chik-fil-A (who has, at least, the courage of his convictions, and the willingness to take the backlash to them). He does not, like Ted Turner, put huge , life-changing sums of money into UN programs to help the world's neediest. Instead, he chooses as his cause the vague idea of political bipartisanship—not a philosophy at all, but rather, at its core, a call for decorum. In other words, Howard Schultz, a man with the economic, political, and cultural power to really effect serious change in the lives of large numbers of people, a man with the type of clout necessary to effect true political change in America, has chosen, as his pet issue, political politeness. Rather than be bystanders, we have an opportunity-and I believe a responsibility-to use our company's scale for good by sending a respectful and optimistic message to our elected officials to come together and reach common ground on this important issue. This week through December 28, partners in our Washington D.C. area stores are writing "Come Together" on customers' cups. Look: coming together is not a platform. It is not a proposal. It is not a solution. It is not a way forward. It is simply a point of order. It is like asking two nations about to go to war to take Christmas day off: nice and all, but the war will still happen, and all the bad things that go with the war will still happen. Asking for politicians to "come together" is something a child would do. It is childish. It is not an adult proposal. An adult proposal would be along the lines of: "In order to most effectively get past this political crisis in a way that benefits Americans the most, the policy should be (X). The most effective way to see to it that this policy is instituted is (Y)." Billionaire CEOs with vast power and responsibility should make adult proposals. "Daddy, will you promise to be nice at work today?" is a proposal that we can leave to the children. Bipartisanship, "the end of partisan rancor," "civility," and things of this nature are not things that really help the average American. The average American is helped by policies. There will always be political disagreement on policies. Therefore, the average American is helped by leaders who do what it takes to enact good policies, even in the face of political opposition. If this involves yelling at one another in Congress a bit, that's okay. That will not hurt the average American. What hurts the average American is not being able to pay the bills. "Partisan rancor" only hurts the feeling of congressmen, and pundits, and talk show hosts, and people like Howard Schultz. Howard Schultz is putting his influence behind a cause that will, if successful, primarily have the effect of making Howard Schultz's visits to the set of "Morning Joe" slightly more pleasant. For everyone else in America, what matters is the policy. Politics is disagreement between competing interests. It always has been, and always will be. Adults who care about helping people will concern themselves with figuring out how to create and enact policies that give the greatest benefit to the most people. Not with the vague notion of "coming together" in a completely cosmetic way. If all the politicians are polite to one another while enacting a policy that screws average Americans, the average Americans are still screwed. Patriotism is the last refuge of scoundrels. Bipartisanship is the last refuge of cowards. That's the weakest cup of coffee in town.